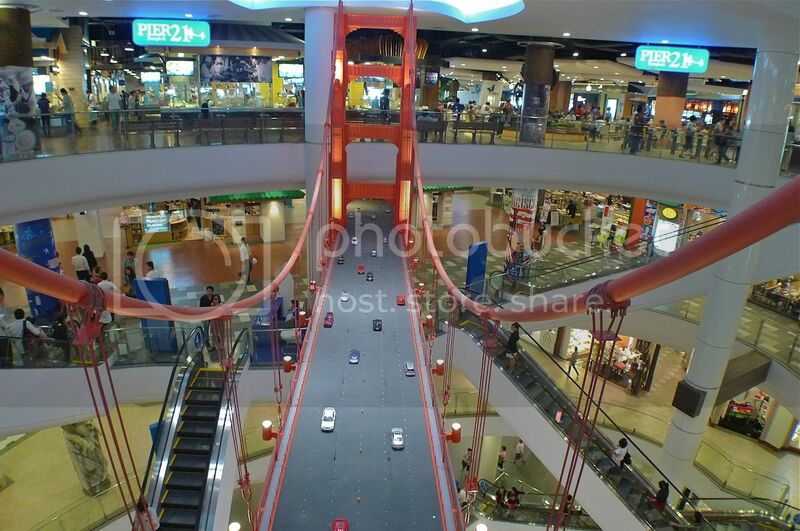 Walking all 9 floors of Terminal 21 shopping mall in Bangkok, taking pictures of their amazing toilets and iconic landmarks was fun! Add in a little bit of shopping and both my friend and I did not even know it was way past lunch time! It was actually the sound of our stomachs growling that reminded us we had to eat! But where to eat? There are many restaurants in Terminal 21 but most can be found on the 4th and 5th floors around the Golden Gate bridge of San Francisco. We decided it was best to have our lunch at the food court called Pier 21. Located on the 5th floor of Terminal 21, Pier 21 is a modern food court with lots of choices of food. Just like the food court in MBK shopping mall, you need to buy coupons at the coupon booth and use these coupons to pay for the food. 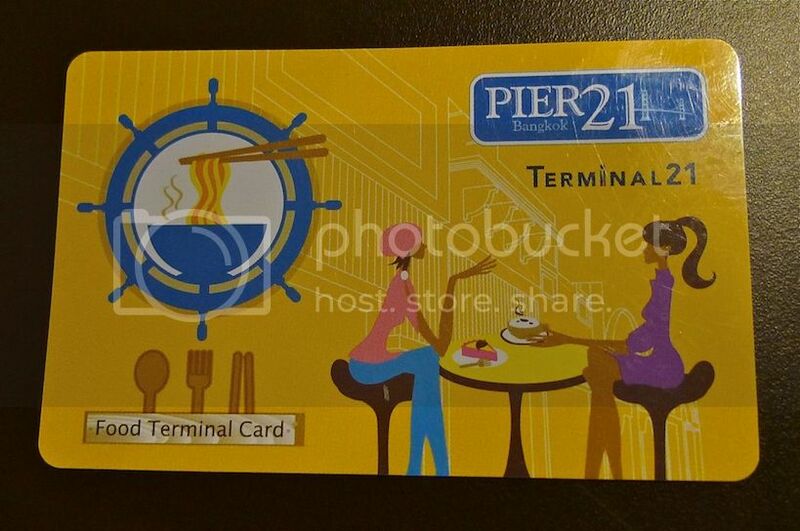 However unlike the MBK food court, Pier 21 is a little bit more advanced - it uses a Food Terminal Card instead. Just purchase the amount you want at the Card booth, and then pay for your food using the card. The person at the food stall will swipe your card and print out a small receipt so that you know how much money is left on your card. If you did not finish spending the whole amount in your card, you can always return the card for cash. 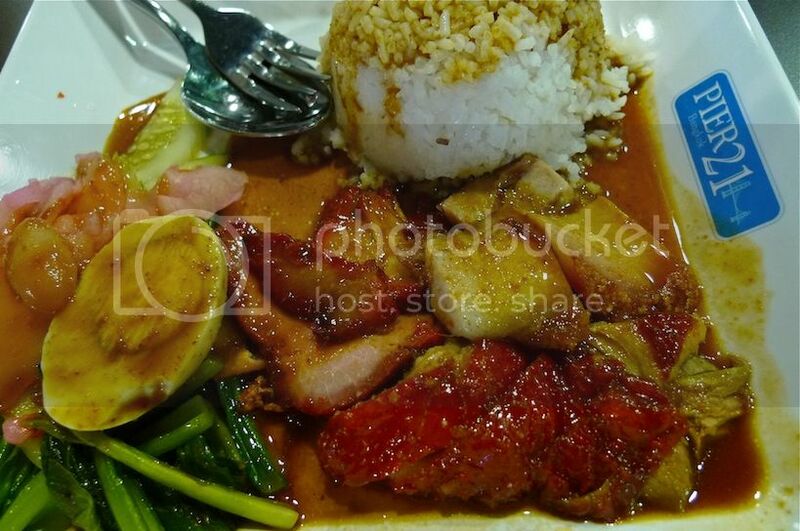 Both my friends and I ordered similar dish - roast duck and pork with rice. Priced at 40 baht (RM4), the duck and pork meat were delicious! With the yummy sauce slathered all over the rice, I could not help finishing all the rice too! OK, I know we should have ordered different dishes so that we could share and have more choices, but somehow, we didn't. When I passed by the desserts stalls, I could not help but order the durian with sticky rice. I have been waiting to eat this dessert long before my trip to Bangkok! Priced at 30 baht (RM3), this durian with sticky rice was not too bad, but I felt it was not as good as the one I had at the MBK Food Court. (Read about it HERE). I could not really feel the chunks of durian flesh unlike the one I ate at MBK. We had wanted to order more food, but decided against it. Why? Well, because before eating at Pier 21, we passed by this restaurant called Jeffer. 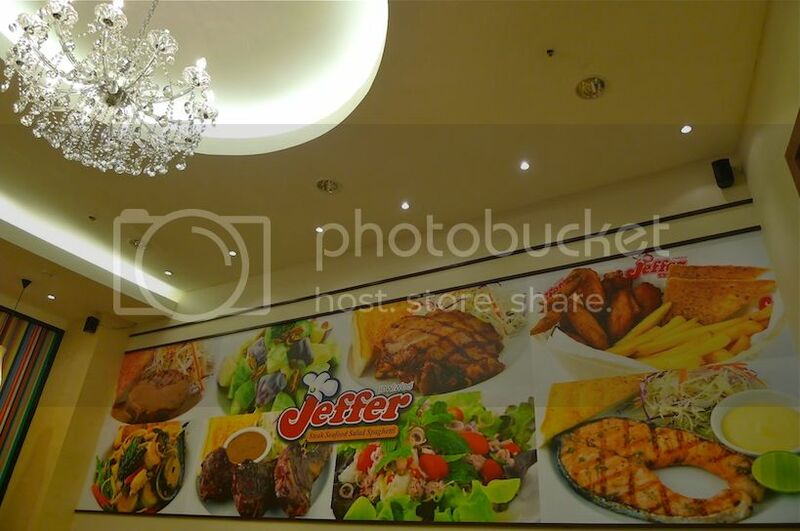 I had eaten at Jeffer Restaurant in Silom during my previous trip, and really enjoyed their steaks. (Read about it HERE). But during this trip, I discovered that the Jeffer outlet in Silom was no longer there! I was quite devastated. So imagine how happy I was to find another outlet here in Terminal 21! Located on the same floor as Pier 21 - in fact, it's just a short walk from Pier 21 - this Jeffer restaurant offered the exact same menu as the previous outlet in Silom. Now you see why we had to stop ourselves from ordering more food at Pier 21. We simply had to eat at Jeffer! Ooh! 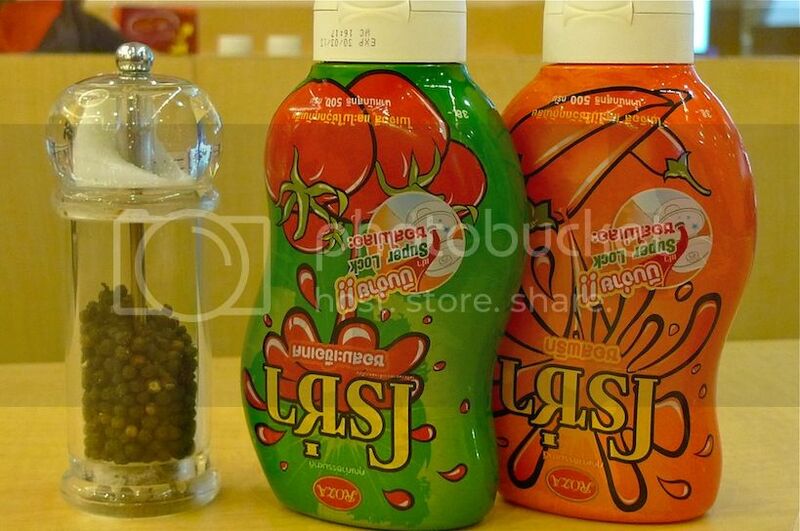 Cute tomato and chili sauce bottles on the table. Believe it or not, both my friend and I ordered the same dish....again! LOL! 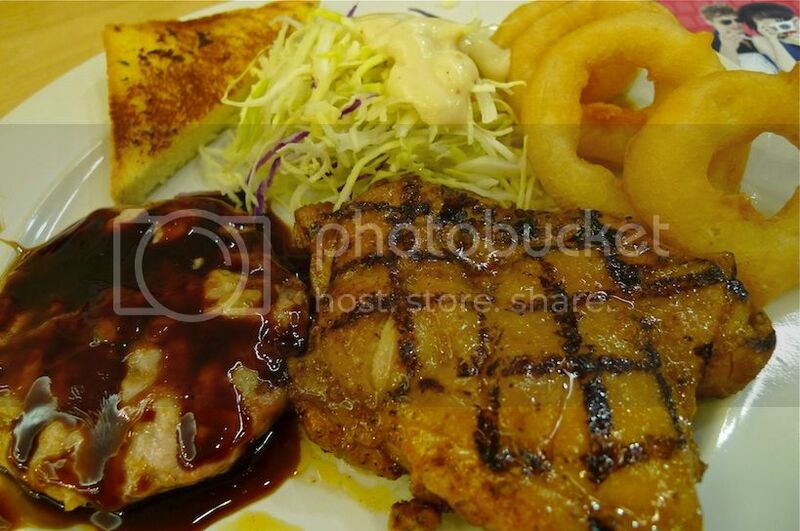 It was their signature grilled chicken and tender pork with fried onion rings, toast and salad. Price was an affordable 119 baht (RM11.90). At least I still enjoyed their blended pineapple juice! Yum! After lunching at both Pier 21 and Jeffer, I was way too full! Do you think you can eat as much as me ... or even more? LOL!